Hi everyone and welcome! Thought I'd just share a little of my life recently (and it might go a little way to explaining why I've been unable to drop by your blogs in quite a while). 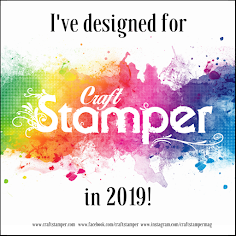 Obviously the DT work and demos have continued apace (had the BEST time ever at PoppyCraft in Wallingford) and closer to home at Back2Craft in Walsall it was fast paced and furious with four in depth make n take sessions in one day! Thank you to everyone who came along to these for making them so enjoyable, and to the lovely Verna and Val at PoppyCraft and the wonderful whirlwind that is Sarah at Back2Craft. 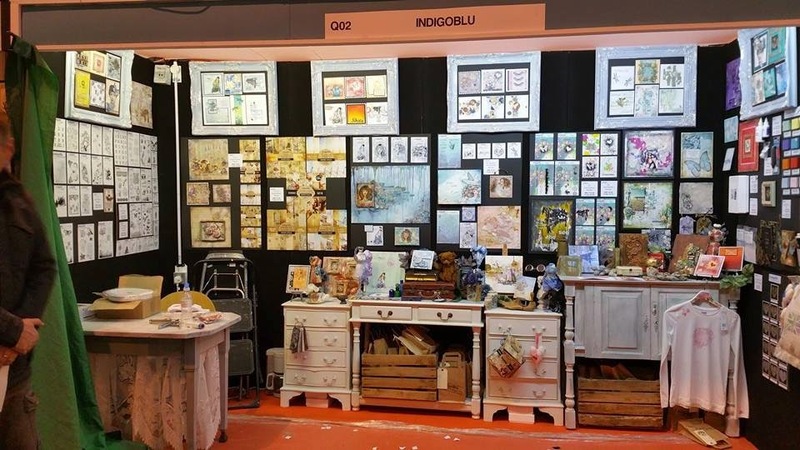 Then it was off to the trade show at the NEC, Birmingham to a place I was thrilled to call home for three days, demo'ing on the IndigoBlu stand! Seriously, it was SO busy that I didn't get any photos of the stand (thank you so much Kay for this pre-show shot and for the chance to do this!) The stand had everyone in raptures (huge round of applause to the DT/demonstrators for the awesome samples) and they were LOVING the new stamp designs, papers and seeing what could be done with English Cottage Artist's Acrylic Paints. Best not to ask me what was on display at the show! I got as far as seeing Finnabair and the Decoart stand (with the fabulous Mark Gould and uber-smiley creative wonder that is Andy Skinner) but that was it. It was lovely to have some of my personal heroes drop by the stand to say hello too - Kath Stewart was taking a well deserved opportunity to just enjoy the show, my good pal Rosella Cottrell flew by in between demo'ing and her shows on C&C, and Jennie Boxall came by too with Mal by her side. Then I finally got to meet the gem of a lady that is Julia Stratford-Wright in person. How long have I worked alongside and 'known' this lady and yet it took until now to finally get to see her irl! Can't even begin to describe how fantastic it was to catch up with the beautiful Brenda Brown throughout the three days (boy, that lady has stamina!) and we were joined by another creative genius and all round lovely person, Astrid Maclean on Tuesday! You'll probably have spotted that the paint splattered pinny was welded on to me permanently the whole time. 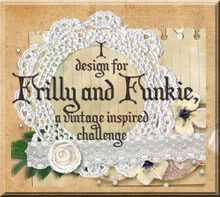 I'll be back tomorrow with that step by step for Frilly and Funkie so I hope you can drop by for that. Sounds like life is incredibly busy indeed! Love the photo of you with Brenda and Astrid. Good morning Jenny, you have tired me out just reading about your "life" at the moment. As long as you are enjoying it all, that's the main things. Life is too short not to fill it with what you love doing. A great round up of your busy days Jenny!! Don't forget to enjoy it too!!! Super photos and I was so happy to meet up again!!! Sounds fantastic - thank you for the photos! Looks a fabulous fun time Jenny. Thanks for sharing your photos. Ohhh I do love a good vicarious vacation and I had the best time at the local little craft store and you are just plain ADORABLE!! Loved all the smiling pictures. 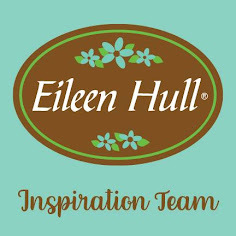 So glad you're having fun and remember the old saying, " A dirty house is the sign of a happy creative woman." Jenny you must be either running on adrenaline or absolutely shattered by now! Thank you for sharing those photographs. I can tell you had the most amazing time and it is wonderful to read that you are in such high demand, you deserve all of this. It must be lovely to meet up with blogging friends. It sure looks like one great time and so lovely to see some of my DT Sisters enjoying each others company! Hugs! What a busy time you've been having - but you deserve every moment of the opportunities and successes coming your way. You know I thought you were fab in the tv spot, and it looks as though you've been equally brilliant in the classes and demo-ing - a big bravo all round. And fab to see the photos of all those lovely people too. Looks like a wonderful time! So glad to see so many familiar faces having fun together. Such exciting times, how wonderful to meet all those wonderful talented folks! Wish I lived on your side of the pond so I could join in the fun, lucky folks who got to learn with you! Such fun I know! I am so happy you are doing this!! !